East Windsor Connecticut native Brian Chicoine followed his heart and love for country music to Nashville in 1998, where he honed his singer/songwriting skills on Lower Broadway performing at Layla’s, The Bluegrass Inn, Robert’s Western World, Tootsie’s, Second Fiddle, and Legends Corner. Brian shared the stage with some of Nashville’s top musicians, opening for BR549, Shooter Jennings, Dale Watson, and others touring around the South and out to Texas, where he soaked in the sounds of the Austin music scene. After a decade stint in Nashville Brian returned to New England in 2008 with an arsenal of original songs, road experience, and tales from road life from Nashville to Texas. Then in 2010 he decided the time was right to reform his Nashville band with seasoned professional players from the North that shared his vision and love for Country Music. Performing in a retro country style, pulling influences from Memphis “Sun Records” and the legendary “Bakersfield Sound,” and of course music that came out of Waylon Jennings “Hillbilly Central” Days. Their rapid fire selection of Country Gold Hits ropes you in and doesn’t let go. The Troubadours are fresh full of swagger with a modern edge, and their outspoken outlaw attitude and 2015 self-titled All Original Song Album are in direct retaliation to the slickly produced records coming out of Nashville, and have made them “The Thorn” in the side of Modern Country Radio. 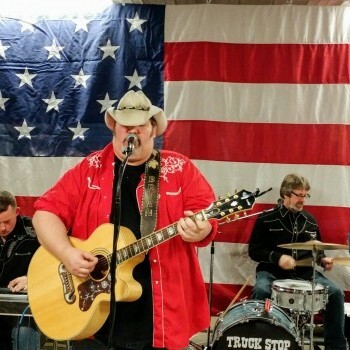 Truck Stop Troubadours are a tried and true “Genuine Country Band.” Accept no substitutes for the real deal.